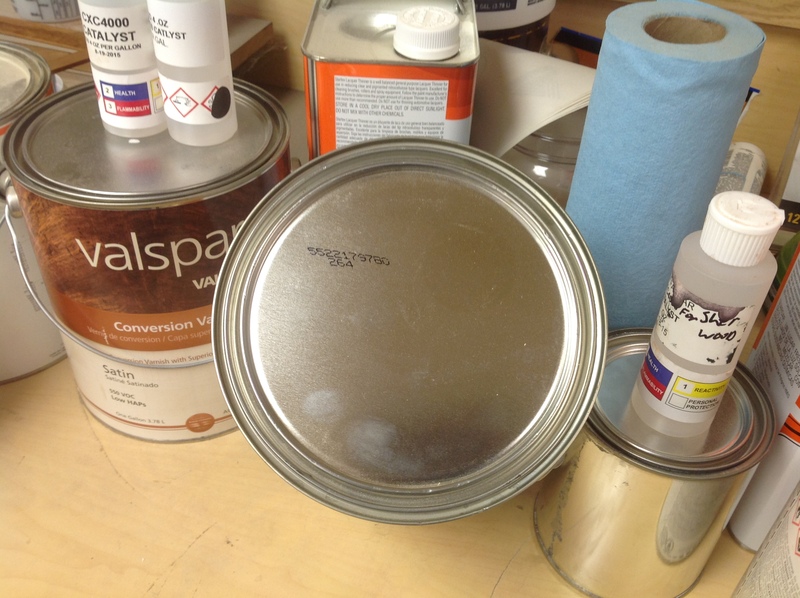 Valspar valguard conversion varnish auf5502 catalyst cxc4000 this is the product I'm using the problem I am having is it is not drying very fast it is taking 48 to 60 hours for it to cure out enough to sand and not be sticky feeling. I am catalizing at 1oz per 32oz. And not thining using right from can.shop temp is 70 degrees. Don't know what's going on but somethings not right I've yoused this product in the past with no problems. I've tried to call valspar but can't get through to talk to any one spent over an hour on hold yesterday recording said every one was busy and one time I did get transferd to a tech's voice mail left message but got no call back. so I gave up. Does any one have any suggestions or a name and number for a Valpar tech that might be Abel to help? Kevin - Sounds like the catalyst is not doing it's job. What is the product number on the can of catalyst? The catalyst number is cxc4000. After I had these results from the first aplaction I went and got a new can of cv and catalyst and got the same results. I have some catalyst used with Sherwinwilams cv but I can tell its is thinner in viscosity,think it would be worth trying it or would that be a bad idea? Valspar cv has a shelf life. Check the date on the can. This could be the problem. I see no date on can. Their is numbers printed on lid but nothing that looks like a date code? Are you using stain? If so what brand? Are you using a sealer? If so what type/Brand? In a situation like this I would mix a small batch i.e. 16 oz. clear ½ oz. cat. Then spray it on a sample of the same wood used in the project using the same sanding schedule with no stain or sealer. If it dries properly then you can start narrowing it down. For example if you used stain then do a stained sample. If this dries. Then do a stained sample with the sealer that was used if any. Etc. But honestly it sounds like a situation that I got myself into before. The project would not dry properly. So I did the steps above. The conclusion was that I thought I added the proper amount of cat. But I was distracted for a moment and did not put the correct amount in. No sealer using cv as self seal the stain is also valspar it has a exp date on it and it's fine. Been using this stain for years with no prior problems. Have sprayed cv on bare wood and the results are the same. Kevin - the catalyst for conversion varnish is an acid. If the catalyst for the Sherwin Williams finish uses the same acid in the same strength as the Valspar then you can use it. If it's a different acid then it's better to not mix the products. The Valspar Valguard CV lists 2 choices for a catalyst. The one you're using - CXC4000 - contains 5-10% Phosphoric acid (CAS 7664-38-2) and is added to the finish at 3% per volume. The other catalyst - CXC4010 - contains 10-25% p-TSA monohydrate acid (CAS 6192-52-5) and is added to the finish at 10% by volume. What SW catalyst do you have? The material safety data sheet (MSDS) lists which acid it contains and the tech data sheet for the finish tells you how much to use. There's a small chance it's the same as Valspar, but probably not. Have your supplier check the expiration dates on the product you have and give you another can of finish and catalyst with a different batch number. I agree with Paul. If you done a sample with a fresh batch as per my first post using the original product that you used for the project and got the same results. More than likely you have received an outdated batch or for whatever reason a defective batch of CV and/or cat. Kevin - The Sherwin Williams V66V21 catalyst is 38% p-TSA (CAS 104-15-4) and is added to the finish at 3%. You can do a test using this catalyst at 3% (1 oz per quart) to see if the Valspar catalyst you have is bad or if it's the finish. Well I finally figured out what the problem was I've been mixing up small 16oz batches and evidently with the small batch sizes the 4000 cat wasn't doing the job for what ever reason so I switched to the 4010 cat witch is mixed at 10% and everything is working fine now. Doesn't make sense but I guess the 3% 4000 cat just wasn't enough.